Throwing fish to the penguins? Like many others my understanding of the task of the adult catechumenate has developed over the years – or at least I think (and hope) it has. I’m sure that when I was first involved in the process as a catechist my first instinct was to try to teach the faith, only. And the faith I tried to teach, or share, was largely to do with belief about this or that. Such beliefs are important. And we are instructed that one of the tasks of the process is that encounter with the tradition of the Church. Cf RCIA 75. My first approach has been challenged by the experience that that there was often a world of difference between what I was trying to teach and what was being learnt. And often enough this gap existed because the ‘teacher’ hadn’t paid enough attention to those he wanted to teach/wanted to help learn! RCIA 75 also requires that part of the work of the one charged with enabling the formation of catechumens is to help them to share in our life in common. If that is not being achieved in the catechumenal group – not just in terms of warm fuzziness, but in terms of careful attentiveness, and readiness to serve actual need then the effectiveness of other dimensions of the formation we offer is going to be compromised. Faith is also about relationship. Relationship with God and relationship in the Church. So, over time, I’ve moved from process which is mostly about input, to process to which is more about engaged and mutual reflection. How are we finding God? How are we finding each other? This reflection is not empty of belief about this or that, or God or the Church. But it is about much more than that belief alone. It’s about how these things matter to us, and why. Not just why they could or should matter to ‘them’, but why they matter to me, and maybe will matter to ‘us’. It’s quite challenging, is this. It leaves the catechist somewhat more vulnerable to the process because it requires more in the way of personal commitment and transparency to the group. It’s less like throwing fish to the penguins, and more like getting in the pool, joining with the others in the search for that food, the ICTHUS, the nourishment of life or heart and soul that only God can give. In the past year I’ve returned to parish ministry – after some years doing other things. I find myself once more taking part in the work of the adult catechumenate in a particular parish community. And I’ve inherited a format which is resiliently based on the school year, a six months all-in-one structure. And this brings a challenge. How best, within those present constraints, to equip those in the group for Christian living beyond their (relatively short) time in the RCIA group? Adult learning often goes quite slowly – even when people more, more or less, volunteer for it. Responding to people’s sometime active and passionate desire to learn and grow helps, of course; as does putting the effort into trying to discern what it is that the group experience can help people to learn helps that process along, but there are still very clear limits to what can be achieved in 6 months or so. Given these circumstances, and my reading of them, I think my understanding of my role, during this year and over time, has shifted yet again. We try to focus on responding to what those searching for faith and those beginning to live more deliberate and consciously faithful lives are ‘ready for’. And we try to be aware of how the members of the group have a right to know what the Church believes about God and herself and the world – at least in the basics. But there’s been something more too, and that’s trying to remain ever conscious of how what we are doing and sharing in will give our catechumens and candidates skills to draw on the resources of the Church in the future. What does this amount to – well, for example, not only teaching about the scriptures and making use of the scriptures in our gatherings, but again and again speaking of how in our prayer with scripture outside of these gatherings, and outside of Mass, we can meet with the Lord and deepen our knowledge of him. Or, another example, focusing on how we pray the Mass and the presences of Christ there, building up an expectation that, week on week, what we should expect to change at Mass is not just bread and wine, but us. And the other – answers on a postcard please, because I’ve really not made much progress on this one – is trying to see how we can continue to support the members of the group after the ‘given’ period of mystagogy. One challenge in this, that our catholic parishes as a whole are really very a-mystagogical in the way we live, share in sacraments, and consider our faith. Maybe, just maybe, the way we resource our catechumens and candidates this year will help them to serve as a sort of leaven in the batch. Why do we think Evangelisation starts at the Church door? So how do you recruit? It may not be the right term, but if we put as much energy into recruiting as the National Trust do, just think of the numbers we may be initiating into the Church. Two things got me going on this, one was a comment about the likelihood of a Rite of Acceptance, that ‘we may have someone who has just joined the RCIA. They’ve been to the first session’. The second was when I was literally standing at the front door to the parish office and was told ‘that we might have a couple of ‘nibblers’, who’d made an approach. It was probably standing at the outside door to the parish office that did it, but I suddenly thought, how we were failing prospective Christians by waiting for them to approach our church. Both the above comments recorded the expectation that enquirers make their first approach to the church, and while in some respects that is correct, we seem to have forgotten there is an even earlier stage. What might it take before we get into the mindset of being open to evangelisation away from the church door. The first thing is to note that evangelisation is not taking every opportunity to ‘preach God’ to the unconverted. It is not proselytising and it’s not moralising. I think of it as being open to the Holy Spirit working in others and using me as its instrument. I couldn’t stand on a street corner and proclaim the Good News of God, but I’ve come to see how in subtle ways I can open other people’s hearts to the joy and hope that Jesus brings. Here is one example. Somebody I know (but not a close friend), who has had their share of worries in their personal and family life, sent me a text one Sunday morning asking when I went to church if I would ask my God to keep a special eye on someone for them. It came right out of the blue from someone who had previously told me they couldn’t find God in their lives because of all the troubles they’d endured. I was delighted to be able to text back and say ‘of course’. I got another text the next week, asking if I would please send the same words to God. I must have been a bit slow, because it needed this text to make me think that I should be doing something other than praying, as I’d been asked. Eventually, I sent a text with a little story about a close (non baptised) friend of mine, who at a time when she was experiencing some family problems, had told me how she liked to call into churches, any church, and look for a statue of a beautiful lady, with a serene face, who she would talk to, and how it used to make her feel calm, and at ease. After my text there was silence for a while, and then I got a text back that mentioned about looking for a very easy book about God. I thought of all the books I’ve got and realised that a story version of the Gospel was the best book to start with. I got an email address and sent a few ideas. ‘the precatechumenate is of great importance… It is a time of evangelisation: faithfully and constantly the living God is proclaimed and Jesus Christ who he has sent for the salvation of all. Thus those who are not yet Christians, their hearts opened by the Holy Spirit, may believe and be freely converted to the Lord….’ (# 36). Being honest, I know in my parish that the message has not yet got through that it is the whole Church, (RCIA General introduction 7), all the baptised, who have a part to play in the very first period of the RCIA (# 8). Until the ‘entire community’ understand that their individual and collective role as Christians is to ‘proclaim the Good News of the Kingdom of God’ (EN 14) then new Christians will only enter our church when they manage to arrive at the church or parish house door. Until RCIA ceases to be the domain of the few who make up or are affiliated to the RCIA team, the whole dimension of ‘witness’ will go undetected and undervalued. I’ll end with a suggestion. 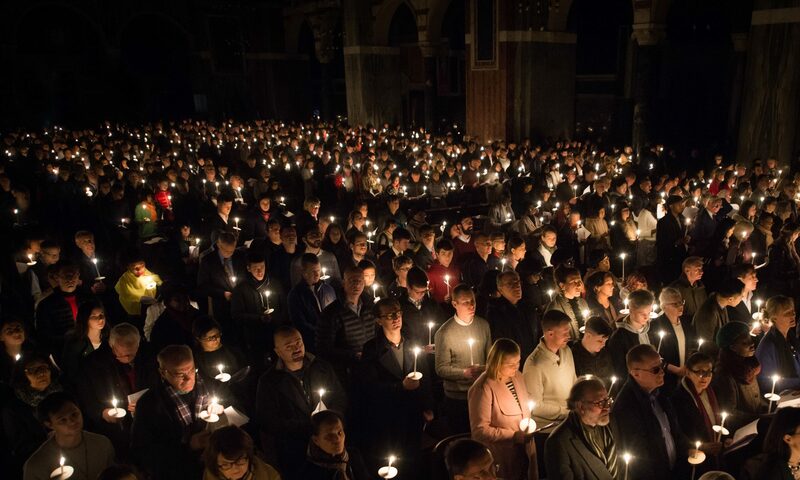 As our fully initiated Catholics emerge at the Easter Vigil, how might we benefit from their experience? Has anybody analysed and assessed how the last ten years of enquirers got onto the RCIA? How many of our PPC’s have anyone with responsibility for evangelisation? What strategies can we introduce for reaching out to the unchurched?